Amazon may have missed profit estimates but the bigger story is that Amazon is heavily laying the foundation for things to come. The only worrying sign: Slower unit shipment growth. Revenue increased 22 percent to $43.7 billion in the fourth quarter. Net income was $749 million, or $1.54 a share, the Seattle-based company said Thursday in a statement. Analysts estimated profit of $1.36 on revenue of $44.7 billion, according to data compiled by Bloomberg. Sales in the current quarter will be $33.3 billion to $35.8 billion, the company said. Analysts projected $36 billion. Amazon Web Services revenue was $3.5 billion in the fourth quarter, up 47 percent from a year earlier. Cloud computing is Amazon’s fastest-growing and most profitable segment. Operating expenses rose 23 percent to $42.5 billion in the quarter. „Net sales increased 27% to $136.0 billion, compared with $107.0 billion in 2015. It may have been a mixed quarter, but Amazon still had a very busy 2016, much of which was spent laying down a foundation for future plans. On the hardware side, the company’s Echo speaker, which comes equipped with virtual assistant Alexa, has been a roaring success. Echo device sales grew nine-fold in the 2016 holiday season over the same period in 2015. Amazon warehouses shipped more than 2.5 billion units on behalf of sellers last year and, logistically speaking, the company is setting the stage for an even larger e-commerce and distribution presence: It wants to sell more types of products to more people, and deliver them faster than ever. Amazon spent $5.7 billion on fulfillment centers in the fourth quarter, up from $4.5 billion in the fourth quarter of 2015. Amazon also doubled the number of items it shipped for third-party vendors last year, which could also have contributed to revenue fall-off (Amazon makes more money shipping its own goods). According to Amazon founder and CEO Jeff Bezos, the company added “tens of millions” of new paid Prime members last year. But the company has never disclosed how many Prime members it has. He noted that last quarter, Amazon launched Prime Video in 200 countries and territories — making it the only real global competitor to Netflix. Prime Video is now automatically available at no additional cost to Amazon Prime members in Belgium, Canada, France, India, Italy, and Spain, in addition to its previous markets of the U.S., U.K., Germany, Austria and Japan. CFO Brian Olsavsky, on a call with analysts Thursday, said the global launch of Prime Video in Q4 was an important step to getting better return on its investment in original productions. Previously he had said Amazon’s spending on video content would double in the second half of 2016 versus the year prior. “It’s very much a fixed-expense base… and the ability to amortize that over a large population is what we’re looking for,” he said. In 2016, there were over 100,000 sellers with sales of more than $100,000 selling on Amazon. Given that the marketplace is growing in importance and relative size to the rest of Amazon’s commerce business this is promising: It makes the overall customer experience more consistent while at the same time increasing Amazon’s sales. 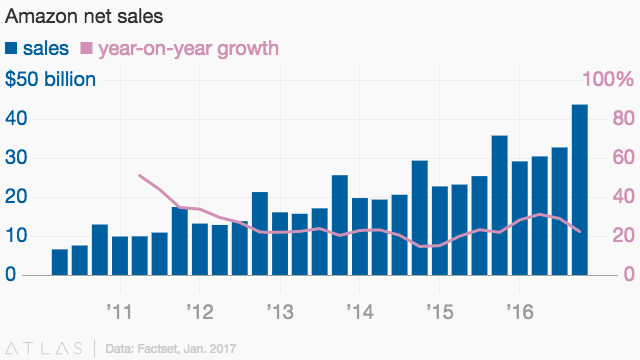 Amazon’s service sales (everything marketplace) grew by 49% from $27.7 billion to $41.3 billion. Unit shipment growth, which had been above 25% for the last five quarters, dropped suddenly to 24%, which impacted overall growth rates, as those dropped for the second quarter in a row. The International business had significant losses for the second straight quarter as Amazon invests more heavily overseas in fulfillment, market entry, and extending services like Prime video globally. AWS grew at a healthy clip, though margins are flattening at around 26% lately. But that slowing unit shipment growth is something to keep an eye on. Given the current market conditions and Amazon’s relative size to the markets it is in, it makes little sense for Amazon’s business to start growing slower. Net sales are expected to be between $33.25 billion and $35.75 billion, or to grow between 14% and 23% compared with first quarter 2016. This guidance anticipates an unfavorable impact of approximately $730 million or 250 basis points from foreign exchange rates. Operating income is expected to be between $250 million and $900 million, compared with $1.1 billion in first quarter 2016.